is a director and writer, known for Sworn Virgin (2015) and Daughter of Mine (2018). Both presented in Competition at the Berlinale, in 2015 and 2018. She was awarded with the David di Donatello in 2010 for Best Short Film for Passing Time (2010) and with Nastro d'Argento in 2011 for Most Promising director for her short Biondina (2011). DS: Hello Laura! 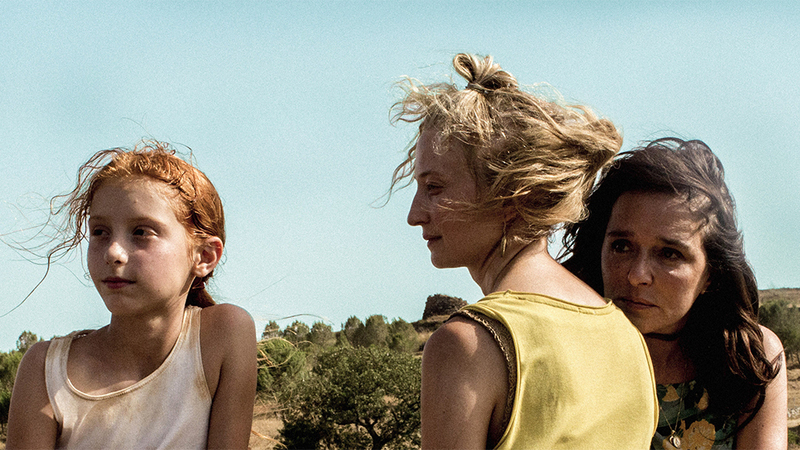 We are thrilled to interview you about your stunning film, Daughter of Mine, on Women and Film! Can you explain the film in your own words? LB: Thank you for the interview and for your work! Yes, the movie for me is a great trip inside of maternity and inside three strong female characters who are very complex. The complexity in this movie is a value, it is something very close to the truth, and consequently to the beauty. LB: The movie was shot in Sardinia, an Italian island. The landscape is very important because I think that it makes the story more universal, like a Greek tragedy. We wrote for a long period and during the process of writing I went a lot of times to the island, I lost myself there and I found a lot of details, faces, atmospheres that I brought into the script. We tried to connect the characters and the story with the world that really exists there. DS: The film features very powerful and complex female characters, at different points in their life. Where did the inspiration for these characters come from? LB: Everything was born many years ago when a friend told me her experience: she was twenty and she lived in a "normal" family with a mother and a father but she wanted to be adopted by another mother. This desire shocked me and I spoke with my co-writer and we started to think about maternity in all directions. We read A. M. Homes' book "The Mistress's Daughter" and we tried to think about an original story. We started to desire a strong triangle. From the beginning, we wanted a fight between the two mothers who are at the same level, who have the same rights to be the mother of Vittoria, in different ways. We liked the idea to have a girl who was in part like one mother and in part like the other one. All the characters have a dark part and a bright part, like every one of us, and we tried to go inside these two parts of them in a sincere way. We tried to follow the characters step by step and to create a link between them like a cord. So the narrative process stays very close to this emotional cord with three points of view. The most difficult thing in the movie is to have these three points of view. DS: The film deals with themes of innocence and corruption, a sense of morality that it perhaps arbitrary? Would you agree with that? What is the takeaway you hope viewers get from the film or would you rather each viewer come away with their own interpretation and experience? LB: I don't like movies with a moral, with the truth in their pockets, in my film there are only some questions around the most important link for every human person, the link with maternity. In this trip, there is also the tale of identity, the tale of nature and culture, blood and love, the desire for escape and protection, the ability to overcome the human complexity. At the end of the movie Vittoria accepts the complexity of these two mothers and becomes a sort of mother to them and also becomes free and strong, she is like a superheroine, she can face up to the world. This is my letter to my daughter and also my big wish to all the little girls in the world, to be strong and free, beyond all the difficulties. DS: Who are some of your influences as filmmakers? Did any films directly inspire Daughter of Mine? LB: I don't know, I like a lot of different directors from all over the world. I like when there is the point of view of the director, a strong visual impact. I like when a movie has a strong emotion and also a deep reflexion about life. So, I try to make a movie with my personal style, my taste. DS: Can you walk us through what’s next for this film? I think many readers would love to know the distribution and promotion process for an independent film. LB: The movie is distributed in the US by Strand Releasing. They distributed also my first movie, Sworn Virgin, and I'm very happy about this relationship with them. I love the U.S and I have a big feeling with this country. My first movie won the Nora Ephron Prize in Tribeca and the San Francisco Film Festival and both the movies had very important reviews in the US from Variety, Indiewire, Hollywood Reporter and many others, so I think there is an important link between us and it's not so usual. LB: From when I started to think about this, I never stopped in my intent. I like mostly direction and writing. Probably I would like production. DS: What does Italian cinema mean to you? There is an incredibly strong and influential legacy of Italian filmmakers, but the overwhelming majority have been men. What does it mean to you to be an Italian woman filmmaker? LB: Italy is a very male system, not only in cinema but everywhere. I went my way without thinking about this problem, I never thought that being a woman could be a problem in my life, in my work and I had a lot of results without this thought. Then, I stopped and I realized that I was alone. There weren't any female travel companions, there weren't women near me. It was incredible for me, where were they? I understood that there was a very big problem in this society. The problem is the system because they want nothing to change, while I want everything to change, so I'm in the fight. LB: In my last movie, one male journalist in Italy was shocked that the male character is on the back of the story. The history of cinema is full of films with only male characters but nobody said anything about this. At the beginning I was very angry about this stupid consideration, then I thought that it's ridiculous, but this is a mirror of a lot of male Italian critics. In general, the male character of the movie (Tina's husband) is very difficult to accept for many people because he is a different model of masculinity, he is a very positive man, he's strong but not in a macho way, he is sweet, he loves his wife and his daughter. This different type of man takes aback many people, more than my female characters. I didn't think that it would happen, but it did and not only in Italy but in a lot of countries. For me, this is an example of how far away we still are from equality. DS: What’s next for you and what is your ultimate goal as a filmmaker? Do you have any projects in the works? LB: I’m starting to write my next movie. It's a political movie and I'm very very happy about this. I think that cinema can move something inside people so my dream is to help to change the injustices of this life.